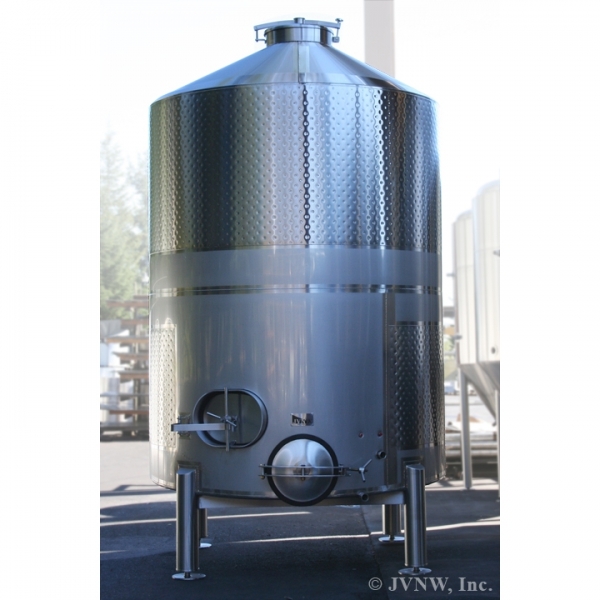 JVNW’s CIP System is capable of heating, circulating, and storing caustic and acidic solutions for the purpose of sanitizing the brewhouse and cellar tanks. The system is sized to clean up to (2) tanks simultaneously, is fully mobile, and wash-down duty. 130 Gallon Caustic Tank: 316L Polished SS with 2″ Insulation, Interior Welds Ground Smooth, Exterior Buffed. Tank includes 20″ Top Manway, 2″ TC Drain, Level Sensor, Immersion Heater, Overflow Tube & Temperature Probe. 130 Gallong Acid/Water Rinse Tank: 304 Polished SS with 2″ Insulation, Interior Welds Ground Smooth, Exterior Buffed. Tank includes 20″ Manway, 2″ TC Drain, Level Sensor & Overflow Tube. 15 HP Self Priming, Liquid Ring CIP Pump including VFD. Wash-down Duty Control Panel including Temperature Controller, Pump Control with VFD, Tank Level, Emergency Stop & Immersion Heater Low-Level Protection. Rugged SS Skid Frame Construction, Fully Welded & Buffed Polished. Heavy Duty Casters with SS Frames & Non-Marking, Corrosion Resistant Wheels. SS Process Piping with Sanitary Butterfly Valves. 50′ Power Cord wired for 460 Volts.